When I began writing Downs Side Up some 6 months ago, my motivation was partly to show the world that children with Down's Syndrome are utterly beautiful, certainly not to be feared and deserve a place in the heart of our communities, where they can live in a fully integrated way and give so much back to those around them. I wanted to uplift and inspire new parents, show them the possibilities, give them courage. I began thinking of a many-pronged approach to reach this aim and the blog became the hub or core from which all other threads emerged. 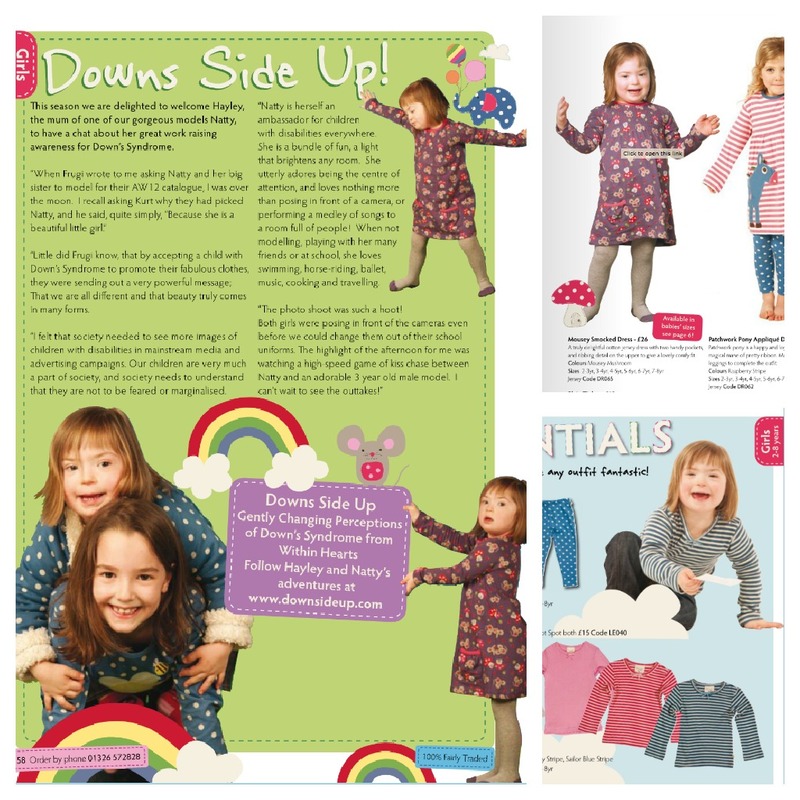 Then came Downs Side Up on Facebook, more recently we've been getting our voice heard on Twitter @downssideup and laterly on Pinterest. It has been amazing to meet so many like-minded, inspirational parents here, but my thoughts soon turned to how I could preach to those who were not already converted. I started thinking that our childrens' beautiful faces should be visible in everyone's lives, popping up in catalogues, magazines, on TV, ads even, another facet of globally accepted beauty. I started writing to companies and model agencies, 2 or 3 a night every night, asking for their support. Several were very supportive but politely said Natty was not 'chocolate box perfect' enough. Others ignored my emails completely. But a special few replied immediately with an open-armed 'yes'. 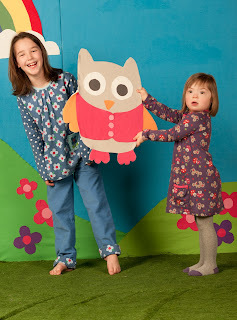 Frugi organic kids clothing was the first, the other was Scott Dunn Travel and then came Jojo Maman Bebe, who coincidentally use several models with Down's Syndrome and are proud to be inclusive employers also. Modelling wouldn't be everyone's cup of tea, but little show-off Natty is a natural in front of the camera. 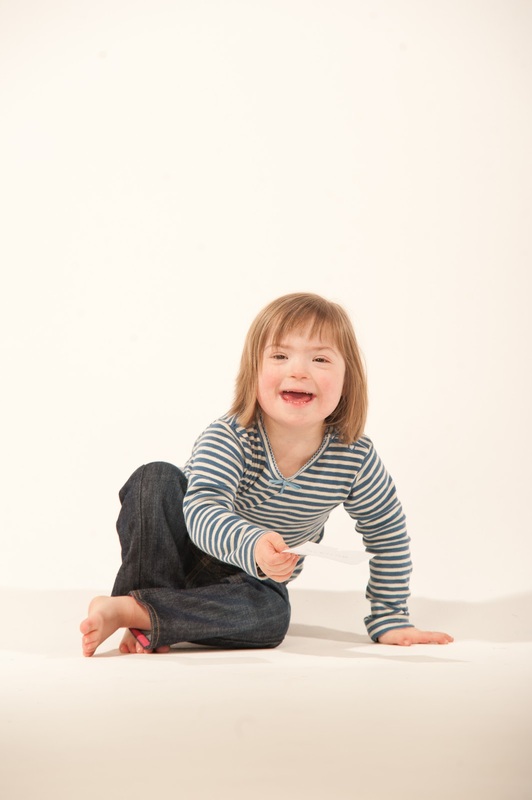 At our first Frugi shoot she began posing before we had even changed her out of her school uniform! Highlights of the afternoon were a vigorous game of kiss-chase with a male 3yr old model, (Natty was to be heard called 'come here and kiss me now! '), stroking the photographer's stubbly beard (No, that wasn't me. Honestly. ), and dancing with a cardboard owl (what a hoot!). 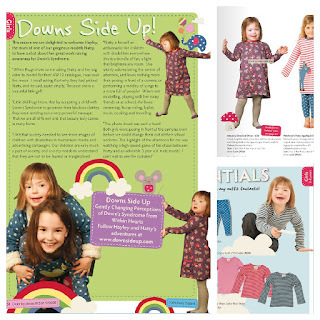 After this, national paper The Sun, online publications such as The Mail Online, our local radio station, Bella Magazine and even ITV show Daybreak wanted to share the story of a little girl with Down's Syndrome taking the modelling world by storm...well, turning it on its head anyway. With each published and broadcast story, Natty clearly shouted from the rooftops that Down's Syndrome is to be embraced, loved and accepted. Of course, all parents of children like Natty know why they are so beautiful. It isn't simply the packaging on the outside that makes them so, although their delicate features apparently echo those of the perfect dainty doll. No, it is something that radiates from within their souls, their innocent hearts, that 'live for the moment' Joie de Vivre, that being utterly absorbed by every activity they take part in, giving everyone they choose to interact with their undivided attention and that born desire to be the centre of attention. Or is that just Natty...? What a beautiful little model, sounds like she had a wonderful time doing it too. This is such an inspirational and uplifting post! She is absolutely gorgeous and sounds like she e is full of so much fun and cheekiness - like any child her age I am sure too. Although it has never crossed my mind before, you were and are right why shouldnt children with downs be models? I know that in the adult modelling world there have been calls for ladies in wheelchairs to be used.